Check out these completely customizable trade show table headers. In this video, we'll break down the kit included with each header and show you how to make the most out of your 6' adjustable stand. Just one aluminum frame can easily morph into 6 different trade show set ups, depending on your needs, with this table header! BECCA (Narrator): "Our OVTHD Series of tradeshow headers and backdrops features multiple options of sizes and add-on components, making this one of our most dynamic and customizable trade show setups. 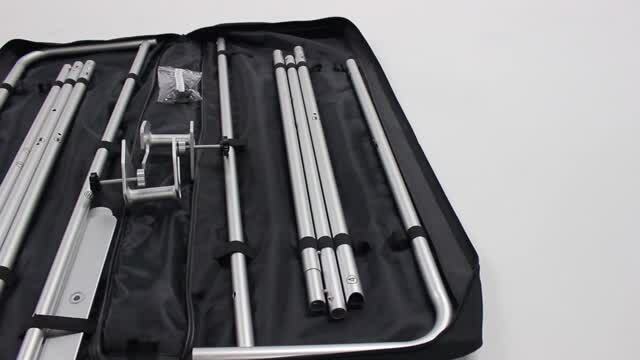 Each sku in the series comes with the base component seen here -  a lightweight aluminum frame with click into place tubes, stabilizing feet, two c-clamps for table mounting, and a durable nylon carrying case. This same banner stand can be assembled into 6 different sizes and can accommodate all of the options available for the following add-on accessories. First, choose between a 6' and 8' folding table for a lightweight and portable mounting option. Second, dress the trade show banner stand with your preferred size of graphics that are made with double sided, full color custom printing. If you'd like a table, full bleed graphics are available in a fitted stretch table cloth. Replacement graphics are also available so you can mix and match sizes and products."